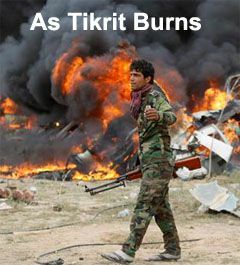 Tikrit is in shambles following it's "liberation" from ISIS. The U.S. and Iraq are now investigating incidents of rampant looting, burning of Sunni homes and businesses, summary executions and and beheadings of Sunni and ISIS captives by the self-proclaimed victors, the Iran-backed Shi'ite militias and the Iraqi military. American and Iraqi officials called for investigations on Friday into reports that Iraqi security forces were summarily executing captives and looting property in Tikrit, and warned that such abuses could undermine the international effort to defeat the Sunni extremists of Islamic State.